with a tease of snow a little north of us. Isn't it funny how cold has a certain look to it, and you can just see the temperature dropping? The street was deserted the afternoon of Christmas Eve, all the businesses closed earlier, the ever-wonderful Michael & I here at work, at last wrapping gifts, and I could see down the road, no cars to block my view, and was enchanted by this store window, the merchandise gone, sold, packed away, just a few things left, I could just see their shapes through the icy windows, growing less visible as the temperature continued to drop and the afternoon wore on, and when at last those teeny snowflakes began to fall, I realized the light would soon fall also and I headed out into the weather, camera in hand, for pictures. They all look like paintings, those images, like textures and blobs of paint and mark making and drips, and it was hard to choose just one for this post, but this one speaks to me the most, the perfect color, a chair/stool, that dark line dividing the "canvas". I can just see Mother Nature scrubbing with rags and pushing her brushes across the surface, holding her breath while making a spot here or there, blending the teal with the gray, with the white, with that pale brown. I know that feeling well. There is also something about this image that moves me closer to my "goal", if indeed that is what it is, as a photographer, that painterly feel of transparencies and textures, with absolute minimum Photoshop, although don't get me wrong, I am a Photoshop aficionado, and am willing to use however much I require to get from here to there, it being all about my vision, and me willing to throw whatever is needed into the mix. Cameron mesmerized by Seurat's Sunday Afternoon. the blues...the frosted look...deserted and excited. I love this shot. Share more please! Have you ever used Corel Painter? I love some of the artistic things I can do to take my photography to the next level. You have such an eye! 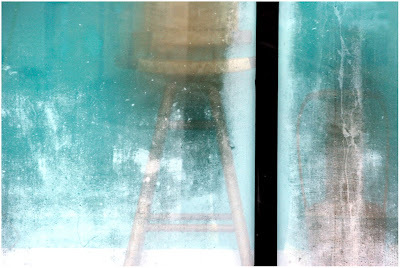 That painterly photograph is wonderful and indeed looks like an icy winter day. You've really captured a feeling here. Love it! Rarely a day passes that I don't visit here and read your words. Every time I savor them and I try and try to think of something to write it return. Some tiny gift to leave behind in thanks for the magic you leave for us to find. You do have a rare gift, my friend. And oh, how I savor it. I am sorry that I don't tell you enough. I just love the painterly look on this photo. Icy blue and frosty white. Absolutely gorgeous color!! Love the abstract nature..the not-knowing exactly what it is we're looking at. There's nothing quite like snow to make you feel like a child. It has the same mesmerizing factor that a campfire flame does. I love the wash of color in this photo. It is dreamlike.